Across the globe, social media has seen a constant upsurge since about a decade. It has always been the hot topic and founders and the users, both have had several experiments to make the best of it. Looking back, it is no wrong saying that the year 2018 has been a roller coaster for social media enthusiasts. 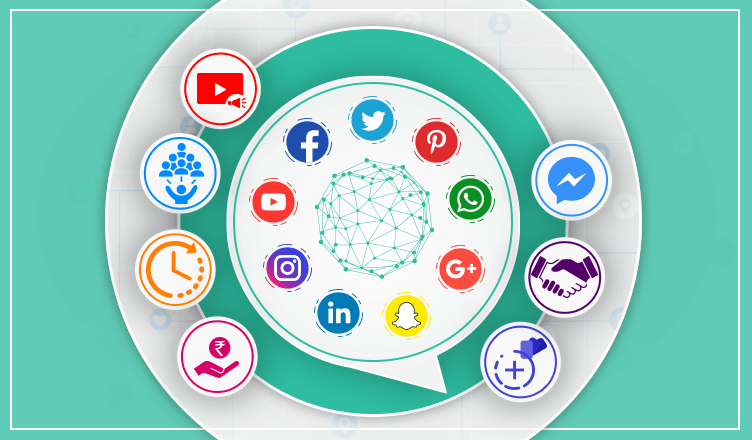 While a number of new and exciting features were introduced, there were times when social media took a toll on its followers: downfall in organic reach, attack on an individuals’ privacy and a stiff competition! Tie your seatbelt to get acquainted with the social media trends for 2019! 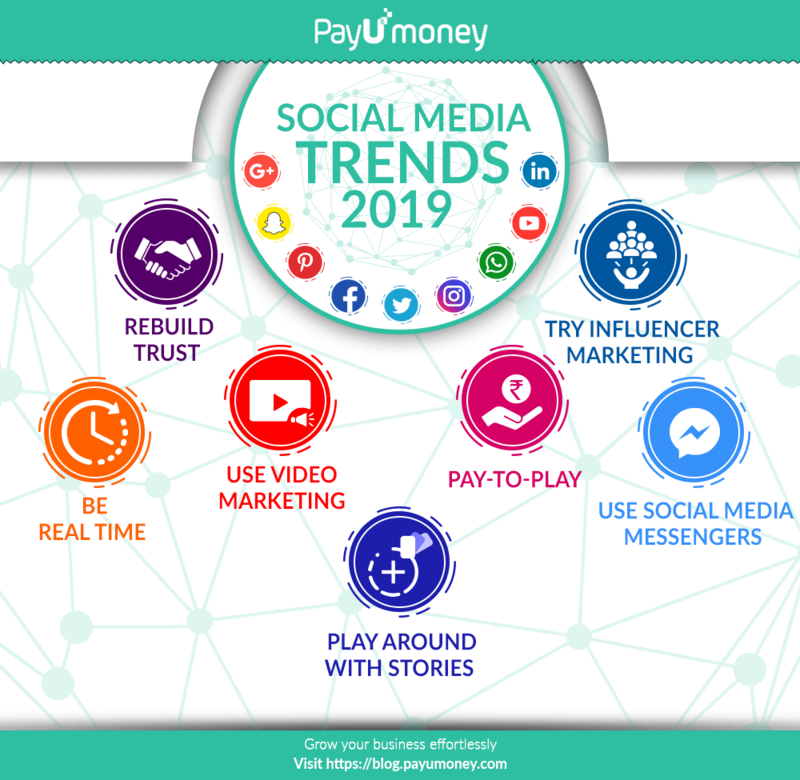 We have prepared a quick guide and thrown some light on social media trends 2019. This will help you make your brand stand out in the market! 2018, in some ratio, was a roller-coaster ride for trust on social media. In recent months, users and media observers have raised questions on privacy, ethics, and accuracy. A recent study by a media giant says that 60% of people no longer trust social media. So, what is the solution? Social media trends 2019 show that smart brands are focusing less on maximizing the following base and more on establishing transparency. The motive should be to let your customers put their trust in you. The personification of your brand is the best thing to do to stay on top of your customers’ mind. Research suggests that videos out-rule all the other form of content. There are various types of videos like a tutorial, testimonial, events, vlogs, demos etc. Videos that show human figure and has a personal touch allow a company to put a face to the business. It enables prospects and customers to get to know who leads and works in a business. We have a detailed guide on Video Content Marketing: Top Trends Of 2018 that will give you 360-degree knowledge about video marketing tools and best practices. When it comes to social media platforms, experiment and see which type of video works the best for your brand. Make sure the length of the video is within 3 minutes. That is the average watch time since social media platforms are scrolled by users on the go! Create a checklist as to which format works on which platform. For example, Instagram does on support GIF format. It also has limitations for videos that exceed one minute. The bitter fact is we are in the pay-to-play era on social media platforms. Marketers have realized that to be the best player, it is mandatory to increase social ad-budget. One in every four Facebook pages now uses paid media to achieve the end goal. Back in 2012, on average, a brand could reach out to 16% of the audience without spending a penny. Today, this number has come down to just 6%. In the past couple of years, social media influencers have become a major trend. There are Instagram stars, Twitter influencers, YouTube millionaires. These people have a huge following and a single post by them is instantly seen by hundreds of people. With an upsurge in the number of social media influencers, their prices have sky-rocketed. Hence, businesses are now in search of an alternative. This is where influencer marketing comes into the picture. As opposed to major influencers, micro influencers exist in every marketing strata. Unlike major influencers, they do not have a massive following. Usually, they have a following of about 10,000 followers but most of their followers are genuinely interested in what they have to say. The best part is that they are very engaged in what they do. Since they are not highly targeted by advertisers, they are trustworthy and down to earth. They hold a lot of marketing potential. While you shortlist micro-influencers for your brand, make sure you pick up the accounts that are relevant to your business/ brand. Check their activity logs, interactions and have a quick verification (by verifying documentation, checking their collaborations etc.). Be aware of fraudulent cases and fake profiles! The near future of social media marketing is real-time marketing. Social media trends 2019 calls for 24/7 customer support, chatbots and social media monitoring in case of any social media crisis. This world where we live in now has no time to wait! Today, consumers want to be heard and get answers real-time. Not to mention, social media never sleeps. Consumers continue to use products, talk about them, and buy a new product anytime. To stay at par with this fast pacing world, we have automated tools that notifies when your brand is mentioned anywhere, can help you schedule your post anytime and generate an automatic reply. So even when you are sleeping, your social media isn’t. Pro Tip: Twitter is the best platform when it comes to being a part of a real-time conversation. Keep a tap on your industry news and make sure you don’t miss out on getting your brand and your consumers engaged. Most of the social media today have enabled the stories feature. This is a feature that allows users to post photos and videos that stays on the profile for 24 hours. They are not only fun and creative, but they are also an awesome source to increase customer engagement, creating brand awareness and driving traffic to your website! Looking at the growing usage of social media on smartphones over a desktop, this feature of social media has a lot of hidden potentials. Stories are visuals which are meant to be created and consumed on the go with nothing more than a smartphone and a creative eye! Since they are ephemeral, there’s more room for experimentation too! Stories feel immediate, real & personal. The trend suggests that, across the board, people are spending more time on messaging and less time sharing the news on social media platforms. This shift from public to private spaces is changing the expectations of customers. A recent survey suggests that 9 out of 10 customers prefer one on one conversation with their favorite brands. It further says that getting in touch with the company personally makes them feel confident about their brand. Create automatic replies on your Facebook & Instagram page. Have an active ORM Team and keep them well-versed with your product/ services provided. Pro-tip: With all the ease of technology, setup bots to assist a visitor on your social media platform. It is the best way to scale your customer service efforts and create a better experience. It is no wrong in saying that social media is here to stay. Social media trends 2019, as projected hold a lot of potential if understood well. Proper planning, powerful strategies and best execution on social media platform can do miracles to a brand. Stick by the above-mentioned listicle to rock this year!